RONAN – Donna Wittlake left for her reunion with her late husband Ed Wittlake, her great-granddaughter Maqualia Stacy and her last best friend Bob Brown, on March 21, 2019, just 13 days after her 88th birthday. Her love for adventure always amazed her family and friends. She lived in Alaska and raced dog sleds; raced stock cars and ran in a 5K desert race in Parker, Arizona, at the age of 64. Her favorite job in life was proprietor of a Christmas tree farm in Libby and selling those trees to Sears and Roebuck. She is survived by her three daughters, Sherri Wittlake (Floyd Lovell), Tudy Wittlake (Stacy) and Darlene Jones (John); her six grandchildren, her nine greatgrandchildren and her three great great-grandchildren. 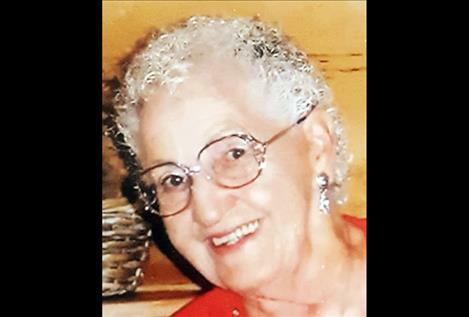 She will be missed by all of her friends and family, especially her best friend Shirley Johnsrud. There will be a memorial service held in July. Memories and condolences may be sent to the family at www.shriderthompson.com. Arrangements are under the direction of Shrider–Thompson Funeral Home.